A wide range of indicators like wages, patents, and R&D employment increase with the population of cities. 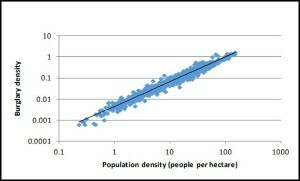 This behaviour is often referred to as urban scaling. The interesting aspect of urban scaling is that it does not follow a straight line, but rather increases exponentially. This acceleration is similar to compound interest. In some cases, the compounding can be dramatic. For example, GDP in European Cities would be expected to increase by a factor of 18.2 when population increases by a factor of 10 and by 331(!) when population increases 100-fold. People are over 3 times as productive in the larger city. Imagine a bank offering 2% interest on £1, 6% interest on £100, 18% on £10,000, and so forth. This is why cities are economic engines. This data suggests that simply moving people from a small city to a larger one would result in a net rise in GDP. In other cases, cities provide economy of scale. Fewer petrol stations are required per person in larger cities. This entry was posted in All Crime Categories, Constituency Crime, Robbery. Bookmark the permalink.